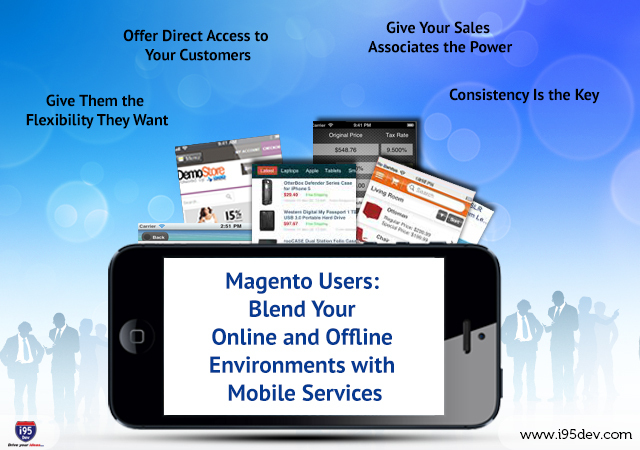 This Next Generation mobile solution for Magento will give you the ability to instantly sync all your offline and online data for the best possible customer service. Online stores provide consumers with a vast array of information to help them make the right choices in their purchases. These stores often use a variety of features to draw in customers, including product suggestions, upgrades and more. This has given online stores an incredible advantage over physical stores. Today, though, more businesses are starting to blend together their online and physical environments to provide their in-store customers with many of the same advantages as their online customers. The great news is i95Dev can offer Magento users an innovative mobile solution that will help you bring the power of the Internet to your physical store. This Next Generation mobile solution for Magento will give you the ability to instantly sync all your offline and online data for the best possible customer service. This blend of online and offline capabilities gives the power to your sales associates. When you arm your sales team with mobile devices, they can quickly and easily access information for customers, helping them find more information on products, the pricing and inventory levels. You can even allow your salespeople to check out customers without the need to stand in line. This provides a seamless experience for your customers and gives your sales associates greater power than ever before. Sometimes your sales associates aren’t readily available to customers. Other customers prefer to look up information on their own without a salesperson standing over their shoulder. When your Magento system is fully integrated with the rest of your systems, customers can use their own smartphones to look up product information, pricing, inventory levels, related items and even compare your prices with other stores. This empowers your customers to make an informed decision, something they truly appreciate. Customers want consistency throughout your store, whether they are shopping online or in your physical store. Integrating your Magento with the rest of your online and offline systems offers you the chance to create a seamless experience for your customers, regardless of how they shop with you. Customers should be able to count on the same experience if they are in the store versus shopping at home from a laptop or desktop computer or even shopping on your site through a smartphone or tablet while they are out. Without seamless Omni-channel commerce, you won’t attract as many customers as you can when your business shows consistency throughout all channels. Your customers want more than consistency along all channels; they want flexibility in their options. Many people like the option to browse at their own leisure and decide to buy a product online. This product is then delivered to their home. Once they receive the product, though, they may need to make a return. Instead of dealing with the hassle of return shipping, customers appreciate the ability to make a return in your physical store instead. This incredible flexibility helps you attract customers because they can customize their experience with you to best meet their needs. These options may sound as if they reflect commerce of the future, but the truth is these options are available now. With the Mobile POS solutions offered by i95Dev, you can create a Next Generation shopping experience your customers will appreciate. Perhaps the best reason to look into this incredible option is its ability to save you money. Our mobile solutions are affordable, allowing any business, regardless of its size, to gain a competitive edge. Contact us to learn more about the plans and pricing we have available. You can also find more information on our product page.